I like illustrations, particularly pen and ink with watercolor wash. Today for Thing-A-Day I wanted to create a faux plate one might find in a book illustrating various species. The inspiration for this piece came from a book I bought a few months ago titled: “Computers and the Imagination, visual adventures beyond the edge“. 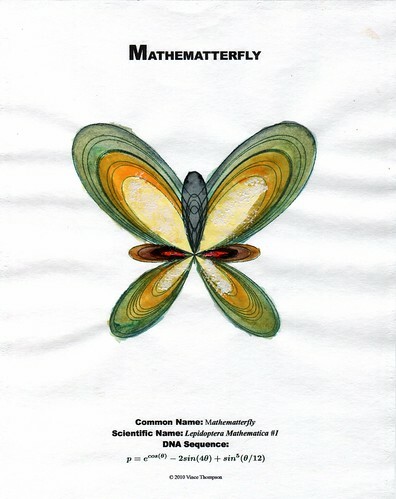 This book focuses on some of the beauty in mathematical equations. This butterfly is a computer generated shape of a butterfly using the equation listed under DNA Sequence. This piece meets a few objectives I set for today. Instead of using watercolor crayons with the pieces last week, I bought some tubes of watercolor paint. I wanted to experiment with mixing and blending colors. It is harder than it looks. I feel these came out too muddy looking. It is going to take much more practice to get to a point where I would like to be in this medium. Another goal was to use the LaTeX formatting I installed last night. I was able to format the equation used in this piece. I also wanted to create a program using the equation to create this image. I used the Processing language to generate the image. The piece uses a combination of tools. Processing to program the image. KSnapshot was used to grab the Processing image. Gimp was used to crop and adjust the image. OpenOffice was used to create the document and placeholder for the image. This combination was printed onto watercolor paper and received a watercolor wash.
For my February 9 Thing-A-Day, I decided to create a watercolor drawing. One of the things on my list of ideas for Thing-A-Day projects was to do a pen and ink drawing with a watercolor wash. Actually, its been on my list for much longer. The watercolor paper I used was from a package I bought about five years ago with the same idea of trying to learn to create watercolor drawings. I finally opened that package today. It’s almost like that package of paper has been a barrier keeping me from giving it a try. Mocking me on days when I notice it setting on the shelf. I need to work on that whole right brain, left brain thing to combine more of the creative side with the analytical side. 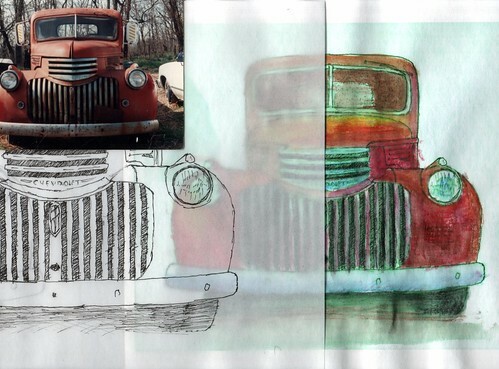 This project started with a photograph I took several years ago of the pickup. It is a 1946 Chevy half ton pickup. 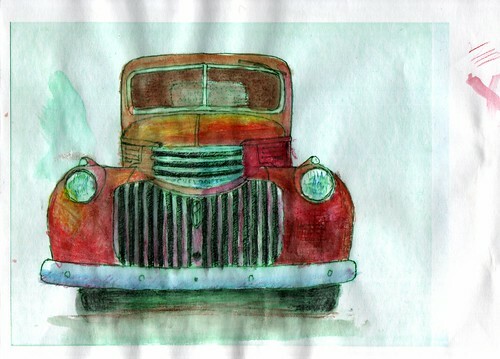 It is an old farm truck my grandfather had. 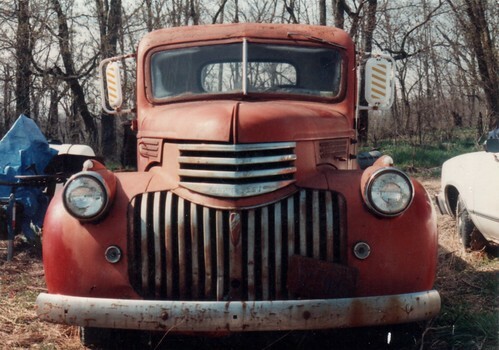 Photo of 1947 Chevy pickup. From photo to watercolor took place with the assistance of Gimp and Photoshop (I’m trying to find my way around in each). I used the programs to edit out the background, enlarge the image, use the edge detection filter, and flatten the range of colors to black and white. I printed out the manipulated image and used vellum tracing paper to ink over the lines. Composite from Photo to Watercolor. After I had the pen and ink drawing, I placed a sheet of watercolor paper in the printer. From there I used my Staedtler watercolor crayons to add color. For the highlights I layered lighter colors like yellow and orange then touches of red. For shadows I used red, and two increasingly darker shades of brown. One great thing about Thing-A-Day comes from inspiration to try new things. I’m excited about the way this turned out and I don’t think that package of paper will be as intimidating in the future. I have access to several books about Photoshop with a lot of great information to help learn the mechanical techniques of operating the program. For me, one book stands out for inspiration more than the others, it’s “Creative Thinking in Photoshop“. It focuses on creating art from a collection of hand drawn media plus manipulation within Photoshop. I have some web sites that I’m beginning to work on and hope to incorporate some hand drawn artwork into the themes they will use. This exercise has given me a good place to start. Silicone Mold for Tripod, Part 1. The pattern for a tripod replacement part. This was posted as my thing-a-day project for February 8. Yesterday I made a replacement part for a tripod I bought at a garage sale. 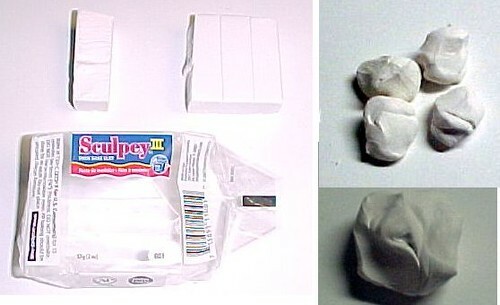 The Sculpey clay part probably would work but I can make a stronger part if I cast it in a urethane plastic. I will be making a two part mold to cast the new piece. Today I’m creating the first part of my silicone mold. I’m starting by cleaning up the surface of the pattern. It would be great if the top surface and bottom surface are parallel to each other. 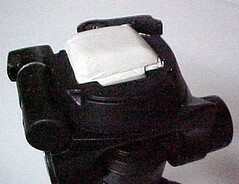 Since the tripod has an adjustment for tilt, I’m more concerned with keeping the top and bottom surface flat. I’m using sandpaper to prepare these surfaces. The silicone mold making materials are expensive and I don’t want to waste them by making this part of the mold any larger than necessary. I found a thin cardboard box that held soft drink cans to form the box. I’ve placed the pattern in the center then rolled out some more Sculpey clay. This time I’m not worried about curing the clay. I’m using the new clay to form a ring outside the pattern part. I intend for this ring to be used as a way of fitting the two part mold together with the proper orientation. I’m not being very careful at laying this out in a perfect square because I’m counting on the irregularities to orient the correct position when we create the second part of the mold later. Positioning the pattern in the box. I intended to tape the sides of the box together but the tape had a hiding place of its own, a rubber band came to the rescue. I folded the box sides up to be held in place by the rubber band instead. With my container built, its now time to start mixing the silicone mold compound. With the mixture ready, its time to pour the goop over the pattern. Filling the container so each side is covered by at least a quarter inch of material. All that’s left now is the cleanup and waiting for the silicone to cure. The instructions suggest letting it cure for 24 hours. Until tomorrow – for the second part of my two part mold. This was posted as my thing-a-day project for February 7. In January our Make:KC group focused on mold making and casting parts. This is a project I wanted to create but was left over from last month. Sometime last year I bought a nice tripod at a garage sale. The tripod was missing the piece that attaches a camera and the tripod together. For my Thing-A-Day project I wanted to make a pattern for a replacement part. My project today is making this pattern. 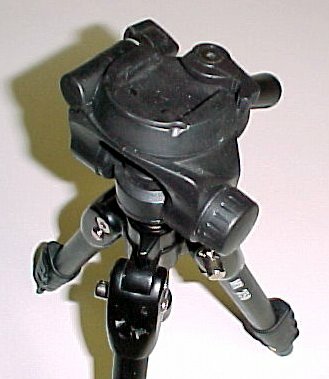 Garage sale tripod missing attachment part. The missing part was designed to be wedged between an angled portion of the front bracket and a rotating latch which also has a specific angle to pinch the part into place. 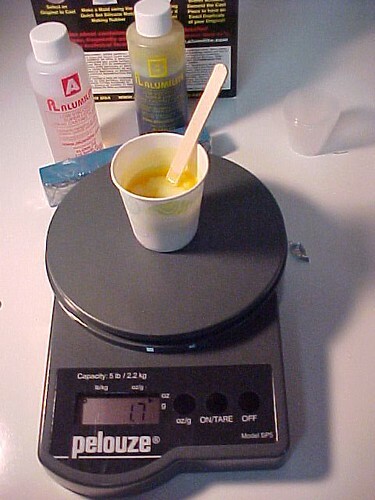 To make this part I’m going to use some Sculpey polymer modeling clay. 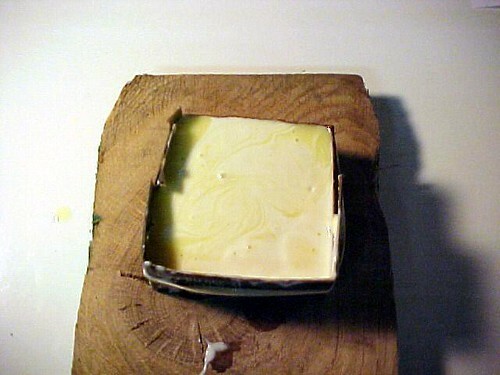 This clay can be formed into the shape required then baked in an oven to retain its shape. 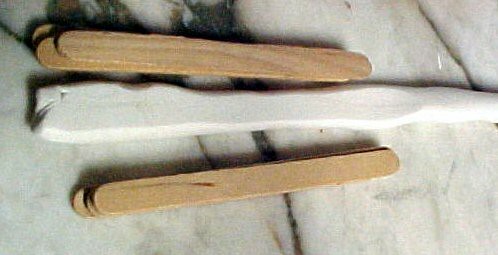 After kneading the clay it’s time to begin rolling out the clay to the precise thickness of about four popsicle sticks. Rolling clay to thickness needed. 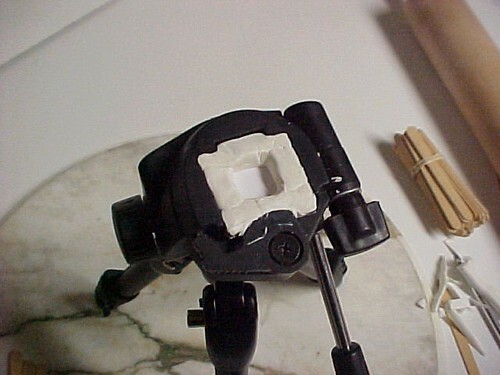 Instead of filling the tripod solid with the clay, I need to leave a void so an attachment bolt has room plus enough width to tighten the bolt with my fingers. The wall widths seem to work if they are one popsicle stick wide. Wall widths measuring one Ppopsicle stick wide. The next step is to begin pushing the wall pieces into place. Squeezing them into place forming the angled latching pieces.. After placing the wall parts around the perimeter another wider piece is formed to cap off the top. Forming the part and capping off the top. 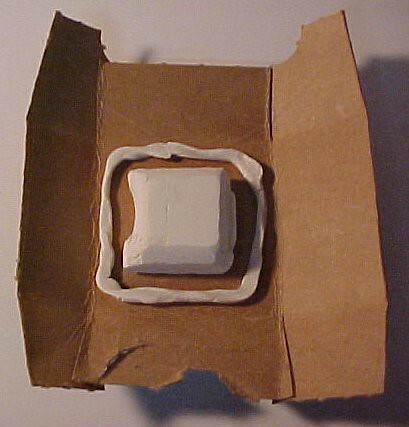 The trick is being able to pull the part back out without deforming the clay. 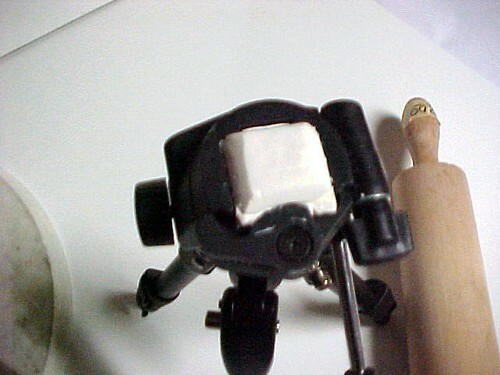 Before placing the clay into the tripod I places a thin sheet of cardboard into the hole. The part pulled back out without much trouble. 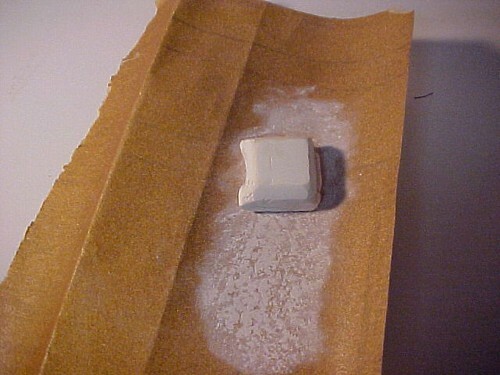 After the clay is formed it’s time to bake the part. 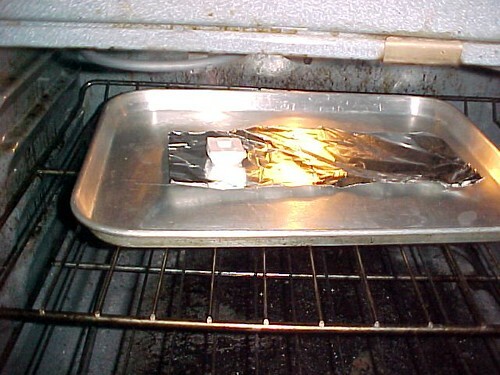 The oven was set at 275 degrees F. and left for about 20 minutes. 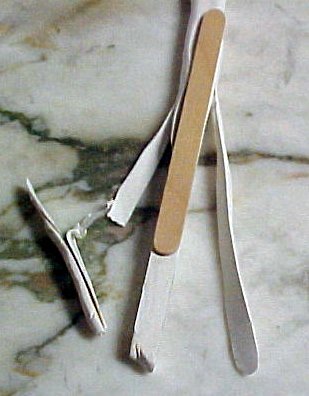 After removing the part it is solid and can be handled without fear of deforming it. 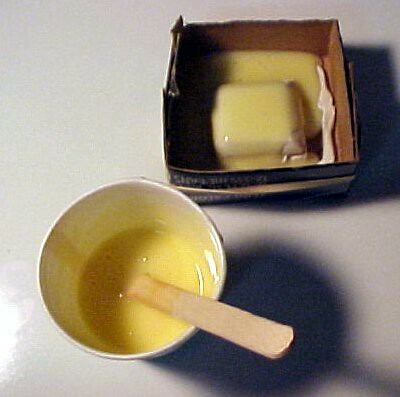 Baking the polymer clay part. The cured part is test fitted back in the tripod. It is a little tight fit but does pop into place. Test fitting the pattern part. The new Sculpey clay part could be drilled and fitted with a bolt to attach my camera. The cured clay part is durable and could work to save the day if I didn’t have any other options and needed the part to get the job done. I don’t want just a quick fix, I want a workable replacement part. 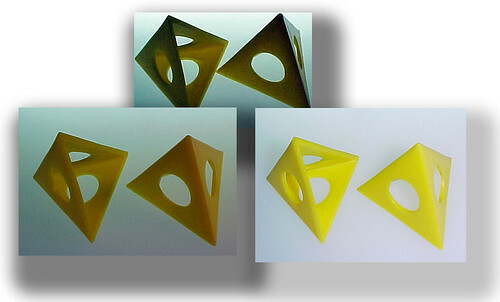 By using this piece as a pattern I can create a molded part with more durable materials. Next project is to create a mold that can be used to cast a new part. 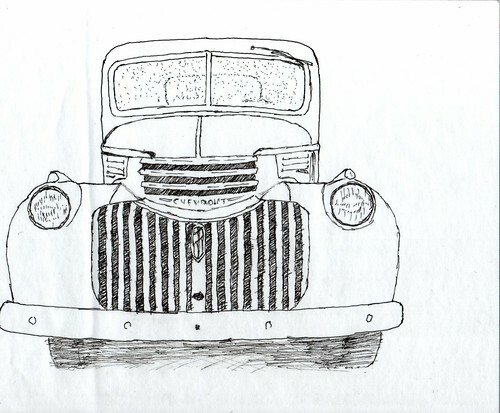 This image was scanned from an old snapshot of my grandfather’s 1946 Chevy pickup truck. I have editied the photo using the Gimp program. Instead of using Photoshop this time which requires rebooting my computer into Windows Vista, I decided to try learning some new techniques in Gimp after some friend’s encouragement. The picture was separated into different layers. It used a white background image. The original photograph on a separate layer. The area outside of the truck’s fender was selected and removed. Another layer was created using a copy of the truck image and converted to a grey scale. Each layer above the background was layer was assigned an opacity value around 50%. 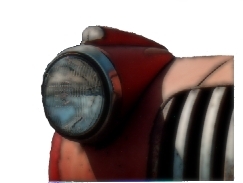 The colored layer was adjusted using the edge detect sobel filter. I was hoping to get an image with an artistic sketch type appearance. I was looking for something with a faded and fuzzy look to represent a faded memory from the past. My Thing-A-Day projects got off to a rocky start by missing the midnight deadline for my first project. I’ve been wanting to learn more about Photoshop, plus I’m wanting to get some promotional materials put together for our Make:KC group. So, for my first project I chose to create a logo using some advanced Photoshop type effects. It didn’t quite turn out the way I imagined but I did learn new Photoshop features while working on this project. I was working from the Photoshop Type Effects Visual Encyclopedia book using their Soft Plastic technique. There are a number of great looking typography styles to choose from in the book. Photoshop is capable of much more than my normal usage, mostly croping photos, adjusting the image slightly, creating a few montage images, and using a few filters. For this project I ended up learning about using the Alpha Channel. I don’t know why I haven’t used the alpha channel before. I kind of remember reading something a few years ago about how difficult it was to use these channels. That may still be true but I found that using the alpha channel as a way of saving a particular selection set within your image was easy and is great. Today I built a Make Magazine inspired portable photo booth. I remember seeing a technique that lifted a sheet of glass or translucent plastic off the work surface and placed lighting beneath (Shadowless Closeups, Make #16). 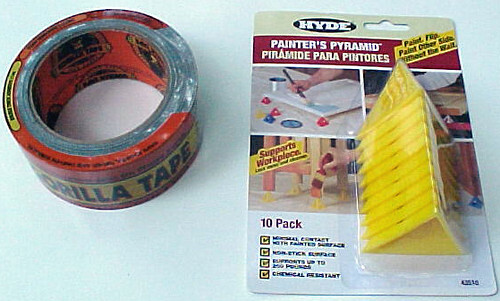 While browsing Home Depot this morning I found a great little item – Painters Pyramid made by Hyde Tools. Idea for a portable photo booth. 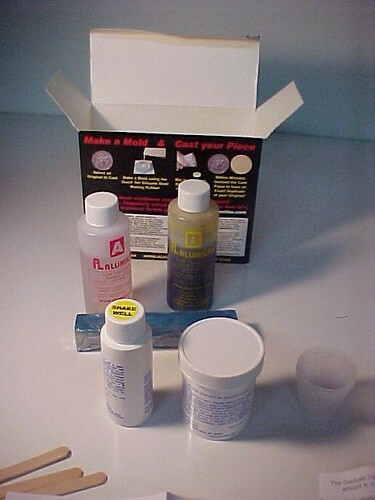 These are little pyramid shaped plastic devices designed to hold freshly painted pieces up so you can paint all sides without waiting for one surface to dry. When I saw these I thought of the Make article and bought some to build a portable photo studio. I bought a 1/8″ thick sheet of 4′ x 8′ white panel board, a roll of Gorilla Tape and the Painter’s Pyramids. With some unfinished projects in the garage today, working off the pickup tailgate in the driveway will have to do. The location I’ll be using to take pictures is on top of a freezer. I’ve measured the freezer’s area and decided on 32″ x 48″ for my studio surface. 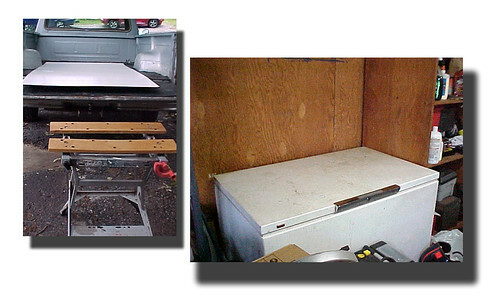 I need two pieces of the board cut at 32″ x 48″ each, so I’ll use the board’s width of 48″ but will cut a 32″ portion off of each end keeping the board’s nice manufactured edges. The two boards will fold together when finished so I want good straight cuts at 90 degree angles. I’m using a solid straight edge clamped to the board and adjusting for the width of my circular saw’s fence. I’m using a square to help get the nice right angle cutting positions. 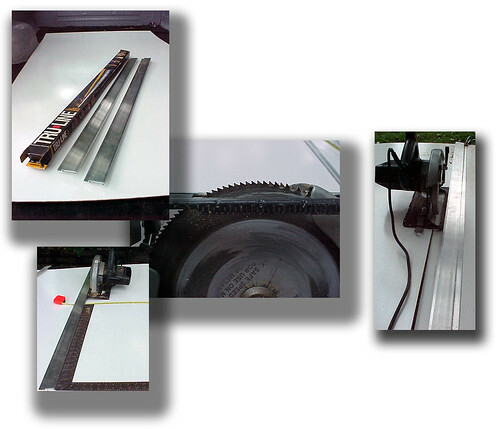 After getting the saw blade adjusted to a good depth I’m ready to make my cuts. With the pieces cut I turn the white sides both facing inside. I square up the edges of the top and bottom sheets. With the cut edges aligned, I lay a strip of Gorilla Tape down to make a hinge. I’ve used Gorilla Tape on other projects and find it a great durable product. 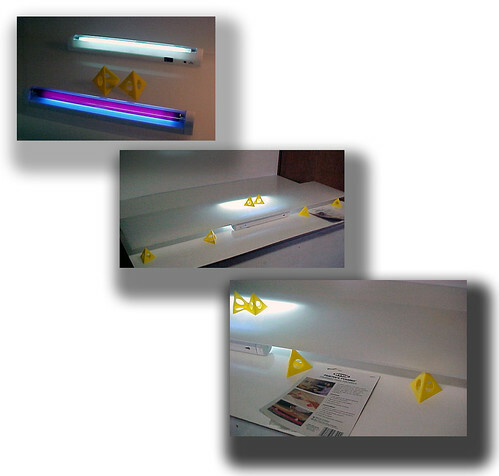 I already had two small fluorescent DC powered light fixtures to test the back lighting. One had a a blacklight bulb and the other white. Test photos of the Painter’s Pyramid tools using various lighting techniques. I’ll be making a few additions to make the folding studio structure self supporting. This is highly portable and easily adapted for photo shoots by using some fabric draping.